Click on the cities for the current ambient air quality data, presented as box plots (looking at the variation in concentrations within a day) and as time series (looking at the variation in concentrations by hour). These plots are updated every 30 minutes; for 6 criteria pollutants – Particulate Matter (2.5 and 10), Sulfur Dioxide (SO2), Nitrogen Dioxide (NO2), Carbon Monoxide (CO), and Ozone (O3). 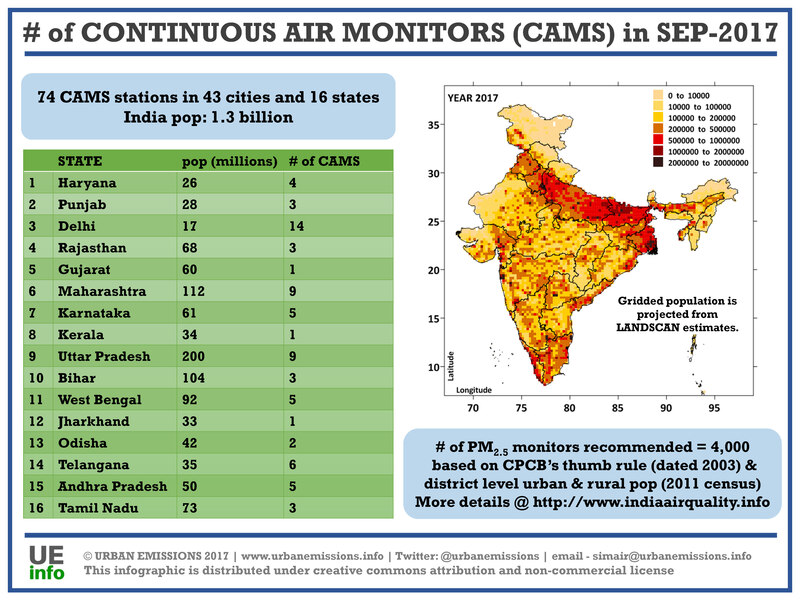 As of September, 2017, under the guidance of CPCB, there are 74 continuous air monitoring stations operating in 16 states and 43 cities – with 19 of these operating in and around the Greater Delhi region (Delhi = 14, and one each in Noida, Ghaziabad, Rohtak, Gurgaon, and Faridabad). Most of the cities have one station to represent the full array of criteria pollutants. This is inadequate as it generates a statistically insignificant sample to represent the city or the range of sources contributing to the air pollution problem in the city. How many continuous monitors are recommended by district and by state? Based on thumb rule proposed by CPCB and the district level urban and rural population (as per 2011 census), we estimate the need for 4,000 continuous monitoring stations (2,800 in the urban areas and 1,200 in the rural areas of the districts, as per 2011 census) to spatially, temporally, and statistically represent the PM2.5 pollution in the urban and the rural areas of India. AQI color code in the box plots is based on national methodology as proposed by the Central Pollution Control Board (New Delhi, India). 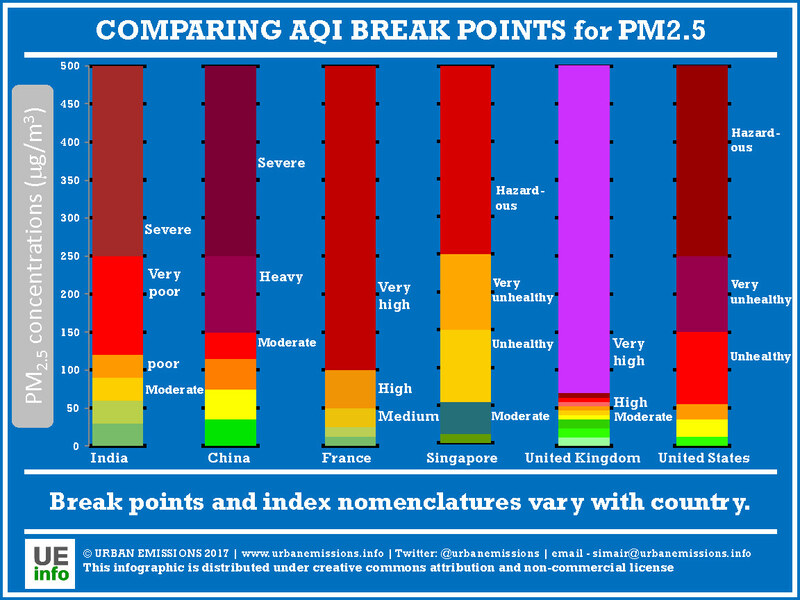 It is very important to note that these index methodologies vary significantly between countries and it is not advised to compare AQI values between countries or cities; which can result in misleading understanding and/or measures. Here is an infograph showing a comparison of the break points practiced in India, China, and 4 other countries. It’s about time we got smarter about monitoring our air pollution?